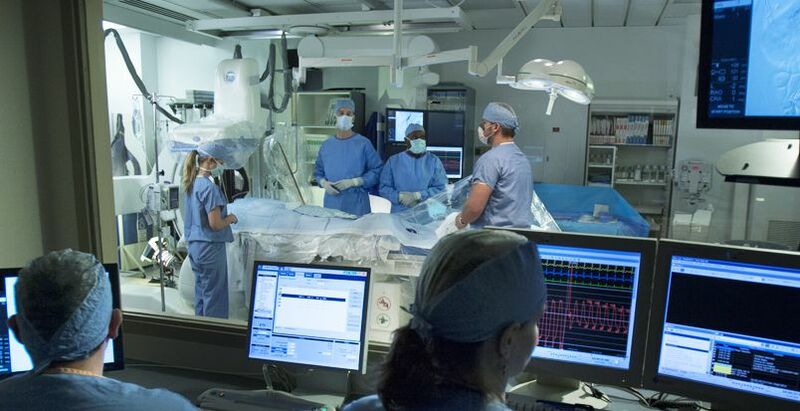 The St. John heart cath lab and angioplasty recovery unit provide interventional diagnosis and treatment services to thousands of patients each year. The cath lab is located just one level above the emergency room to offer life-saving care within minutes of a patient’s emergency arrival at St. John. What does cardiac catheterization show? How do you prepare for this procedure? What can I do when I return home? Cardiac catheterization is a special X-ray test used to look at the arteries and chambers of the heart. The procedure is sometimes referred to as a coronary angiogram or coronary arteriography. A cardiac catheterization is not surgery; it is a diagnostic study that generally takes about one to two hours to complete. This procedure helps doctors to diagnose heart conditions such as coronary artery disease, defective heart valves, or congenital heart defects (defects you are born with). Cardiac catheterization also provides important information about the heart’s pumping function. The procedure is done in a catheterization laboratory (also called a cath lab). Generally, you will arrive on the morning of the day of the procedure. You will possibly go home later that same day, unless you are already a patient in the hospital. You will be awake during the procedure, which usually takes less than an hour for catheterization only. If you have a balloon angioplasty or other procedure, more time will be required. A local anesthesia is injected and a small tube, or sheath, is inserted into the artery in your arm or leg. You may feel a little pressure. The procedure begins when the doctor inserts a thin, flexible tube (called a catheter) through the sheath into the artery. The catheter is passed toward your heart as doctors and technicians follow its movement on TV monitors. Then a dye is injected through the catheter. This helps the doctor to pinpoint where the problem with your coronary arteries might be. When the procedure is finished, the doctor will remove the catheter. A nurse or technician will apply pressure for 15-20 minutes. A pressure bandage is placed on the site before you are returned to your room. If the catheter was inserted in the groin, you’ll remain lying down for several hours and be asked not to move your leg. The nurses will watch you carefully, take your blood pressure, and check the site frequently to make sure there is no bleeding. You will be asked to drink a lot of fluids to flush the dye out of your system. Most people have no pain, and, in most cases, go home that same day. Your doctor will return to explain the results to you. Sometimes cardiac catheterization will show that your heart is just fine. If there is a problem, your doctor will discuss all possible treatments. Be sure to make arrangements to have a friend or family member drive you home. Avoid heavy lifting, and do only light activities for a few days. You may have a small bruise or lump the size of an olive under the skin at the insertion site. This should go away in a few weeks. This is called an invasive procedure because a catheter is inserted into the body. As with any procedure of this type, there can be some risk involved. Please ask your doctor to discuss the risks and benefits so that you are fully informed. It is important to be your own best health advocate. A good way to do that is by committing to routine physical exams and diagnostic tests as often as is recommended by your cardiac specialist. Early detection of heart disease is the key to effective treatment.